Dr. Field can provide you with a full arch of implant-supported, fixed-in new teeth that are functional, natural-looking and aesthetic. Your new teeth will be totally stable in your mouth and will provide you with excellent chewing power so you can eat the foods you like and need for proper nutrition. In most cases, extractions, implant placement and attachment of your new teeth can all be performed on the same day. In the past, patients with bone loss often needed to undergo lengthy bone grafting procedures so they would have enough bone to support the implants necessary for a fixed-in set of teeth. But with the breakthrough All-on-4 technique, almost any patient can receive a full arch of replacement teeth without the need for bone grafting—and usually supported by only four implants per arch. All-on-4 is an innovative procedure that allows implants to be placed successfully even in cases where there is low bone volume and density. All-on-4 takes advantage of the fact that bone loss mostly occurs in specific areas of the jaw, whereas in other areas the bone remains relatively strong and voluminous. 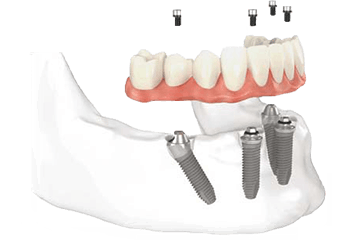 Four implants are placed strategically in areas where there tends to be sufficient bone volume in almost every patient, and they are positioned at an angle specifically designed to provide the greatest stability. In certain cases, Dr. Field will use even more implants if needed. With the All-on-4 technique, Dr. Field can use just four implants per arch to support your new, fixed-in replacement teeth. All-on-4 permanently fixed-in teeth provide between 80 to 95 percent of the chewing power of natural teeth. 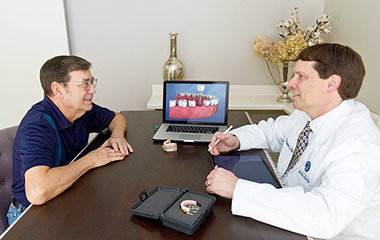 Comparatively, regular dentures offer only about 10 percent of natural chewing power and implant-supported, snap-in removable dentures provide about 50 percent chewing power. For their structural integrity, dentures require a false palate at the roof of your mouth, which can interfere with your sense of taste. A false palate is unnecessary with the All-on-4 method since your new teeth are firmly supported by implants. Your implant-supported replacement teeth will make it possible for you to enjoy the full flavor of foods. Because of the unique positioning and angulation of the All-on-4 implants, there is usually no need for bone grafting. Dr. Field will locate areas with sufficient bone volume and density that exist in almost every patient, and place the implants accordingly. Even patients who have experienced major bone loss due to missing teeth are normally candidates for the All-on-4 procedure. Jawbone needs regular pressure and stimulation from chewing and biting to maintain its healthy bone volume and density. When teeth are missing, the lack of stimulation causes the surrounding bone to assimilate back into the body, a process known as resorption. During the first year when a tooth is missing, about 25 to 30 percent of the surrounding bone is lost. When most or all of your teeth are missing, the lower part of your face gradually sags inward, causing wrinkles and a “collapsed” facial look that makes you appear much older than your age. 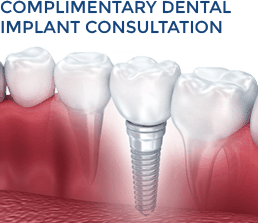 Dental implants fuse with the jaw and restore full chewing power, providing healthy stimulation to help preserve your jaw and prevent further bone loss. 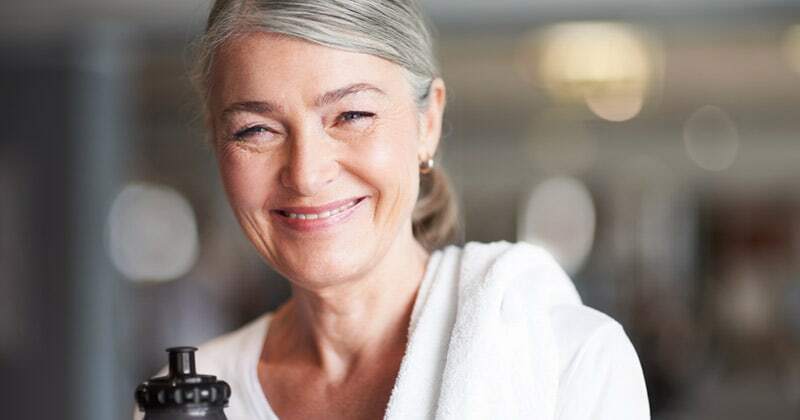 When missing tooth roots are not replaced, as with regular dentures, the bone in the jaw starts to diminish, causing facial sagging and a prematurely aged look. Dental implants can prevent this from occurring. Dr. Field will take great care every step of the way to make sure your All-on-4 procedure is comfortable and efficient and that your new teeth are beautiful, natural-looking and long-lasting. We use advanced digital technology for accurate diagnosis and treatment planning. 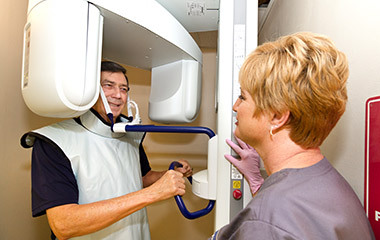 The first step in your implant treatment is an oral exam, followed by a panoramic digital X-ray to obtain a comprehensive structural view of your teeth and jaws. Dr. Field will also arrange for you to receive a 3D CT scan of your entire mouth and head for precise diagnosis and treatment planning. Dr. Field partners with a carefully selected, trusted local periodontist (implant specialist) who shares Dr. Field’s high standards and philosophy of excellent patient care. Our periodontist partner can perform any needed extractions and place your implants all on the same day. You will also receive your set of new, temporary teeth to wear while your finals are being crafted. Dr. Field is highly trained and experienced in crafting new teeth that are beautiful, lifelike and long-lasting. He has received prestigious awards in the field of tooth restoration and he will take great care to make sure you are delighted with your new teeth. Dr. Field uses only the finest materials and he will go over the various options available, along with his recommendations. Once your new, final teeth have been returned from the lab, in approximately two to three weeks, we will have you come back in so Dr. Field can place them. He will ensure that everything is just right, and that your new replacement teeth have a proper, comfortable bite alignment and look natural. “Before coming to Dr. Field, I had bad implants and my teeth were in poor condition. Dr. Field and my surgeon, Dr. Pittman, worked together to get me a permanent new set. 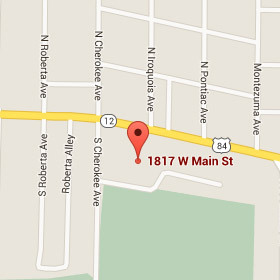 They are the best dentist office in Dothan; you get expert service.